Sipping Café Americano and answering all the queries related with Advance Hair Studio, its inception and successful operations in India, challenges faced in the laser treatment business and much. 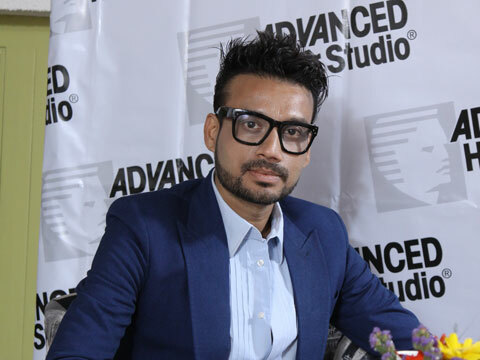 WI Bureau talked to one of the most groomed and knowledgeable CEOs of Wellness Industry, Sanket Shah, CEO & Owner, Advance Hair Studio Indian Subcontinent and Middle Eastern Region about his business plans, expansions and big dreams with the globally renowned brand. We are in business for almost 45 years now, four and half decades and the company was started in Texus in America. Now we have more than 300 studios in alliances across theworld from New Zealand to America. Around 25-26 years ago, we shifted our headquarters to London, UK and Melbourn, Australia and divided the world in two parts, understanding the time zones. In India, we deal with London most of the time because it’s less distant. The reason why I brought Advance Hair Studio (AHS) to this particular region is because I was a client of AHS, since 99, I’ve been their client and I lived in Australia for a very long time and you know, they say seeing is believing and when you have first-hand experience of undergoing a procedure and if you are happy and satisfied, you gain that confidence and faith, not just in the brand, but also in what they do and what kind of results they can produce. It has been a challenging task and after travelling extensively across India, I realized that there is not a single organization which can be called as one-stop shop for any kind of hair loss problem, on one side. While on the other, the awareness among people is so poor and the shocking part is the most educated, well travelled, well versed people living in themetros and mega cities of India, their awareness, education, know-how about different treatments about hair loss problem is so bad that we had to do a lot. So, that’s the reason, I got AHS to India, back in 2007-08 with our first studio started in Mumbai, then second in Delhi and now we are at nine locations. I always tell my team that, rightnow, more than a team, we need to create awareness. We need to give a lot ofeducation to people, to clients who come to our doorstep and event to media. What makes Advance Hair Studio world’s largest and the best by a far margin; there is no secret, because we’ve got four procedures onboard out of which, two are clinical and two are cosmetic. We are the only company in the world where people like myself or entrepreneurs but even plastic surgeons and dermatologists and tricologist performing clinical procedures and hair stylist and hair experts and other individuals, performing non-clinical procedures under one roof. We are only company in the world to perform two procedures clinical and non-clinical in one human scalp successfully under one roof with a help of clinical and non-clinical practitioner, which also makes us unique and that has given us edge over most others. Of course, there are most other people who are trying to replicate what we do, trying to copy what we do, but we have 45 years of track record to do research and development in our departments in the UK & the US and have 3 labs in Australia and UK and US and at all our studios across the world. We get suppliers, products and all equipments and instruments for our procedures only from these 3 locations. So the best part of coming to AHS is what you see in Gurgaon studio, if you go to my Chennai studio, you will see the same in terms of products and medications and instruments. Even you go to London, you’ll see the same and in Sydney, you’ll see the same. So, there is nothing inferior provided in India because we are in India. The awareness among people about laser technology is increasing. There was a phase and time in India when people were scared of the side-effects of laser therapy of any kinds, be it for cancer, be it for eyes, be it for hair removal or be it for hair loss. But, all those things have changed a lot. On the other side, even the kind of technology which is developed in so many different fields, I believe that the future of laser treatment is looking so much better. The biggest challenge in India is myths like hair oils and what not people are selling and unfortunately, there are a lot ofdoctors, who are misguiding consumers. It’s been 70 years,but medical science does not cure a hair loss problem. There is no drug, no formula, no treatment, which can rest a hair loss problem for life and revive dead follicles and grow yourhair back. Thus, it is essential to understand that the people, who are coming to your doorstep, are not just coming with a medical problem, but even more. They are coming with a psychological problem. They are hurt, they are disturb by looking 5, 10, 15 years older than their age. People are laughing at them, passing comments, which are pinching them deep down, so you really need to help them. We are here to stay! We are here to dominate. We have already created a niche in the market and Forbes and Fortune kind big magazines have already written about us. They’ve already acknowledge that we are number one in India. They already understand we have 25 per cent market share and we are not just world’s largest, we are world’s most powerful and richest company. So goes without saying, we will pump in lot of money in this market and we are just making sure that we work hard on training aspect but we are looking for expanding in all metros and mega cities and the key cities, besides 9 which I’ve already mentioned. And we’ve not justlooking at India, we want to be in Colombo (Sri Lanka), we want to be in Dhaka (Bangladesh), we want to be in Lahoreand Karachi (Pakistan), We want to be in Kathmandu (Nepal) and our Dubai operations will start just in span of four months from now and after six month of Dubai, we’ll start in Abu Dhabi and Dubai will play a very crucial role in terms of our development in middle eastern region. We already pumping Rs200 crore in Indian market and we wish to have 20-25 studios up in running by 2017-18. Bright future is foreseen: Bikram Hot Yoga..